Irish rock band U2 on Thursday announced it was postponing its tour dates in Australia, New Zealand, Japan and Hawaii later this month and in early April. In a statement, the tour promoter said the shelving of the final ten concerts of this year's Vertigo tour is unavoidable "due to the illness of an immediate family member of one of the band." 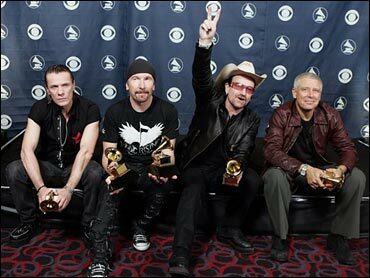 "Any fan of U2 will realize that this decision has not been taken lightly," promoter Arthur Fogel said in the statement. "We will announce further details as soon as we have them." The statement gave no details of the nature of the illness or the band member whose relative was sick. The promoter could not immediately be contacted for further comment. U2 was scheduled to play Auckland on March 17 and 18, before kicking off the Australian leg of its "Vertigo" world tour in Brisbane on March 21, followed by Melbourne, Adelaide and Sydney. The band was scheduled to play in Yokohama on April 4 and in Honolulu on April 8.